As a college in a research-extensive university with strong graduate programs, the College of Humanities and Social Sciences expects its faculty to contribute regularly to the literature and discourse in their disciplines. In some circumstances, a reputable publisher may charge to disseminate the scholarly work of our faculty. To guide faculty, their departments, and the College in allocating the costs of such charges, the College adopts the following policy. Note: This policy applies only to payments to outside parties or additional compensation to employees. Faculty may use their office equipment and their time to produce copyrighted works from which they receive royalties, and employees (e.g., staff, graduate assistants) may provide research or other services in support of a faculty member’s work where such work is consistent with their customary duties and is performed during regular working hours. The policy below applies only to payments to outside parties or additional compensation to employees. Faculty members and departments are responsible for publication costs typically charged by scholarly journals, including page fees, color reproduction fees, fees for use of photos and illustrations, and the like. Faculty and departments are allowed to use state-appropriated, F&A, donation accounts, and (where authorized by the external agency) grant funds to pay these charges. Only in cases where the publication of the work is intended primarily to serve College purposes (e.g., the publication of a College-initiated project or task force) would the faculty member or department seek College support to cover these publication charges; all such requests should be directed to the research office. The department should consider the quality of the publication, with a particular interest in preventing publication in low-quality journals. A list of journals that have failed to demonstrate requisite minima of scholarly merit and integrity is available at http://scholarlyoa.com/2014/01/02/list-of-predatory-publishers-2014/. Faculty and department heads are urged to investigate such journals and to avoid publishing in them. Payments made directly to publishers to support work that will pay royalties to the author are not permitted from departmental funds. If an author or authors choose not to assign royalties to the College, no College funds may be used, and the author or authors will be responsible for any payments to the publisher, and may receive royalty income. If an author or authors assign royalties to the College, the College will consider a request for paying publication fees, such as subventions, charges for illustrations, and other usual costs of publication. Such funds will be drawn from an account established in the Dean’s office to pay these charges. Departmental funds may not be used for this purpose. State-appropriated or F&A funds must not be used for publication fees when royalties will be paid. Grant funds may be used for such publication fees only with explicit approval of the funding agency, the research office, and the author’s or authors’ agreement to assign royalties paid by the publisher to a College account designated for that purpose. 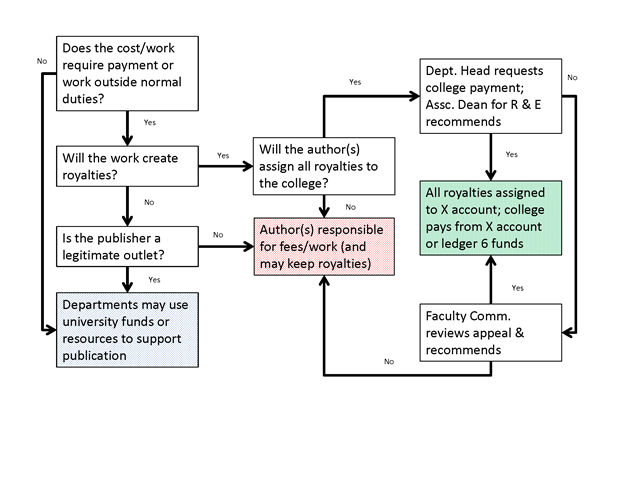 In cases where the faculty member elects to assign all royalties to the college, the college may fund all or part of requested publication fees. All publication funding will be handled at the college level (i.e., departments or other units are not allowed to fund subventions from their own resources, nor are they allowed to accept royalties directly from a publisher). Requests for publication support come from the department head to the college research office. The department head will assemble the case for the scholarly merit of the request. The department head will provide evidence of the quality of the publisher, the results of readers’ reports on the manuscript, and a discussion of whether and to what extent other publishers, who do not charge publication fees, were considered for the work. The Associate Dean for Research and Engagement may recommend to the Dean that the request be funded in whole or in part, or that the College should not fund the request. The Associate Dean will consider evidence of the quality and significance of the manuscript, as well as the standing of the press or journal. Department heads may, on behalf of their faculty, appeal decisions made by the Associate Dean to not recommend support for publication fees. Three members of the College’s research committee will hear appeals, and the result of this appeal will be reported to the Dean. Expenditure of University funds for preparation of work prior to the execution of a publishing contract should be limited to supporting work where the primary purpose is to support student or faculty members’ scholarship, not primarily for direct financial gain. Faculty and staff many not earn additional compensation for these activities. Their work in support of publications must be done as part of their usual duties. Manuscript preparation, editing and related expenses may not be paid to external contractors from departmental or College funds. Authors are encouraged to negotiate such services with the publisher, with such costs to be charged against future royalties. Work undertaken primarily for personal financial gain cannot be supported by College or University funds. Where faculty believe that a publication is likely to require a great deal of initial investment, but that the publication is also likely to yield substantial revenues, faculty are encouraged to contact the Office of Technology Transfer (OTT) to discuss opportunities for support under section 7 of the copyright policy, at http://policies.ncsu.edu/regulation/reg-01-25-03. Expenditure of University funds to support scholarly work undertaken before the execution of a publication contract should be restricted to instances where the primary goal of the work is to contribute to scholarship in the author’s disciplines or fields. Key elements of this process are illustrated below.